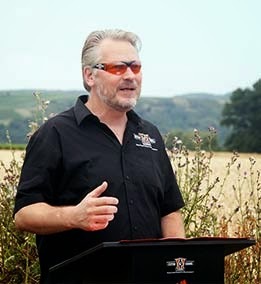 While Custom Chrome USA remains discreet, Custom Chrome Europe, the European market leader for the distribution of aftermarket custom parts and accessories for Harley-Davidson, continues its expansion by building near Bingen, Germany new headquarters and a much larger warehouse to offer better logistics to its clientele. The idea and concept behind the new corporate structure and organization were decided in 2011 when was implemented a plan for a CCE “next day delivery” all over Europe. “The new warehouse will provide improved and ultra-modern modern logistics, which will result in even faster reaction to customers’ orders received before 4.30 pm German time. These orders will be shipped the same day!with a fill rate of 95%” says CCE Managing Director Andreas Scholz. Custom Chrome Europe is currently producing its 2014 parts catalog published in 5 different languages and revamping its online store to feature more than 10,000 custom parts! Due to these huge tasks coming in addition to the big move of CCE in March 2014 to its new headquarters, the company will be unable to organize the upcoming edition of their famous Custom Chrome Europe Dealer Show in Mainz, traditionally featuring all major European and American vendors and some of the best custom builders in the world.